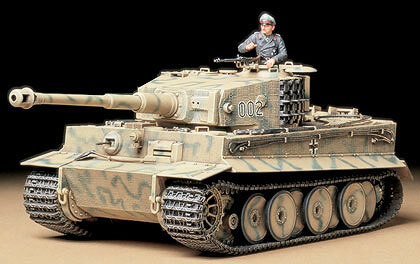 1/35 German Tiger I Mid Production Model Tank Kit Discounts Apply ! TAM35194 - 1/35 German Tiger I Mid Production Model Tank Kit. To counter the Russian T34 tank threat, the German Tiger I heavy tank was placed into service during 1942. Despite its excellent overall design, there were the inevitable minor mechanical problems found in any newly developed equipment. In addition, some improvements were suggested by combat experienced crew members. The most crucial of these was the replacement of the turret commander's cupola. The original cupola was rather tall, and its vision ports used bulletproof glass that provided only a limited view. From July 1943 onwards, a new cupola with seven periscopes and a side pivoting hatch, plus an anti-aircraft machine gun ring mount was provided. Starting in September 1943, a Zimmerit coating was applied to the vertical surfaces of the hull and turret, and a gun travel lock was added to the rear hull beginning from November. The two headlamps on the front hull corners were replaced with a single unit positioned at the center. In January 1944, the pistol ports on the turret side were eliminated. The large diameter rubber rimmed road wheels were still used, but the outer first road wheels were often removed, particularly on the Eastern front due to the muddy and snowy terrain. The Tiger I tanks produced from July 1943 to January 1944 featured these modifications, and are referred to as the mid production Tigers. About 470 units of these mid production versions were produced, and deployed mainly on the Eastern Front.